The UK must remain "permanently vigilant" following the Westgate shopping mall attack in Kenya, Prime Minister David Cameron has said. Six Britons are among at least 67 people killed in the assault by al-Shabab militants in Nairobi. 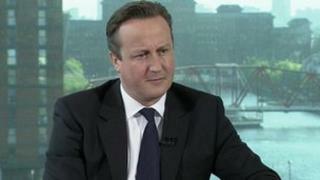 Speaking on BBC One's Andrew Marr Show, Mr Cameron said he had no intelligence of an imminent attack on UK soil. He warned there was a fear of British-based, al-Shabab-trained Somalis, committing outrages on UK soil. Mr Cameron chaired a meeting of the government's emergency committee, Cobra, on Monday to discuss the three-day siege, which ended on Tuesday. He told Andrew Marr: "We have been looking at this for a long time because of the appalling attack that happened in Mumbai in India. "I have personally chaired a whole series of meetings years ago, but again actually this week, to check that we have got everything in place to prepare for those sorts of attacks. "We don't have intelligence that something is about to happen, but it pays to be very, very prepared, very, very cautious, and to work out we have everything in place we can to deal with awful events like this." Any responsible government would look at its own processes and procedures. Mr Cameron said that there remained a threat of British-based Somalis, trained by the extremist al-Shabab group in Somalia, returning to the UK with the intention of committing outrages. He said: "There is always a worry of that and there is a hotbed of terrorism in Somalia that spills over into other countries, and we are concerned about that and follow that. "What it shows I think is that we have to keep going against Islamist extremism, whether that is people that are home-grown in our own country or whether it is extremism that is fomenting either on the Horn of Africa or in West Africa or in Afghanistan and Pakistan. "It goes to this whole argument about why we need well-funded intelligence services, why we need to be engaged in the world, we need to share intelligence with others and why we have to be permanently vigilant." He spoke of how importantly he took his responsibilities as Cobra chairman and made sure everything from ambulance, fire, police and beyond were prepared. He added: "We don't have intelligence about anything imminent, but of course when that Mumbai attack happened and you see what happened in Kenya, any responsible government would look at its own processes and procedures, and say how would we cope with something like that?"